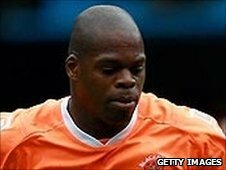 Barnsley have signed Blackpool striker Marlon Harewood on emergency loan until the end of the season. Manager Mark Robins told the Barnsley website: "Marlon is a great addition to the squad. "He has scored five Premier League goals this season and is a proven quality player." The 31-year-old Harewood has made seven starts and nine substitute appearances for Blackpool this season, the last of them in the 1-1 draw with Aston Villa. The former West Ham United and Newcastle forward was a free agent before he joined Blackpool on a two-year deal in August. He scored twice in their opening Premier League game against Wigan but suffered a hamstring injury during training in November which kept him sidelined for a month. Harewood returned to action in the defeat by Sunderland but has failed to score in his last five games.